What is the nature of true love? : Valentine's Day or Schmalentine's Day? Valentine's Day or Schmalentine's Day? 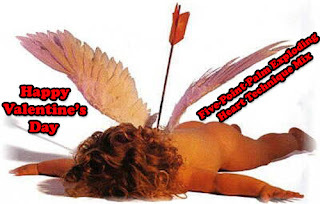 Valentines Day: you love it, you hate it. Sometimes, you feel a little of both. A lot of singletons view Valentine's Day with ire, other's use it as an excuse to celebrate themselves. Some couples stress about that special date, caring for every detail. Then, there are those hopeful expectations only to be dashed with bitter disappointment. Other couples shrug it off and order pizza to celebrate the day for lovers. Two of my favorite Valentine's Days happened when I was single in college and when I had been "coupled" with that special someone for a year. When I was in college, a friend of mine and I decided to boycott Valentine's day. But instead of lurking in our dorm rooms, listening to Indigo Girls and Pearl Jam, we decided to go at it with gusto. We both wore black in protest and headed out to a nearby coffee shop to partake of as many desserts as possible. Other friends of ours stopped by to join in the festivities. We all got high off of caffeine and sugar, and agreed to protest again the following year--regardless if we were single or not. Another time was when I had been dating my fellow for about a year, and I had forsworn any Valentine's Day celebrating the year before--saying it brought bad juju anytime I had a fellow to celebrate Valentine's Day with. But the fellow insisted that the bad luck would not transfer to us. We went out to a nice romantic dinner and had coffee after. He brought me flowers (another bad omen of mine in the past) and we had a lovely evening--despite my fears. That fellow wanted to dash my concern once and for all that Valentine's Day wasn't an apocalyptic day of reckoning, but a day to spend with that special someone. This year we might just order pizza instead--and that is just fine. Every day is special for us. I'm still with my same sweetie, and now I call him Husband. Do you have any special plans? Will you lurk in the darkness and eat chocolate? Are you going out with that special someone? Was there a Valentine's Day that you will always remember--for good or for ill? Inquiring amour-osophersophers want to know! I'm going to a party, getting a spa treatment and seeing a shrink. Sounds like a good way to love yourself--part of a lifelong romance!